TAMPA, Fla. (AP) Jameis Winston insists his injured throwing shoulder isn’t the problem – that he simply has to play better. The Tampa Bay Buccaneers lost for the fourth straight time Sunday, failing to score a touchdown in a game for the first time since their young quarterback entered the NFL as the No. 1 overall pick in the 2015 draft. 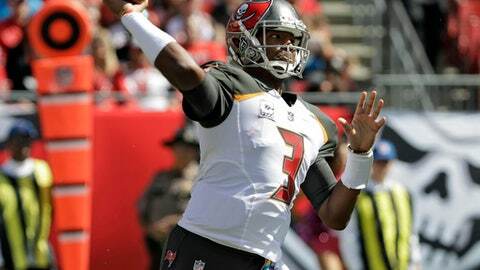 Coach Dirk Koetter thought tricky winds might have affected Winston’s accuracy during a 17-3 loss to the Carolina Panthers, however the 23-year-old refused to use that as an alibi. Playing with a sprained AC joint in his right shoulder for the second week in a row, Winston completed 21 of 38 passes for 210 yards. He missed receivers badly at times, was intercepted twice, lost a fumble, and was sacked three times by a Carolina defense that hasn’t allowed a TD in its last two games. What isn’t debatable is the bottom line. A season that began with heightened expectations after Tampa Bay (2-5) won nine games a year ago is gradually slipping away. The Bucs haven’t made the playoffs since 2007 and don’t have a postseason win since winning the Super Bowl 15 years ago. Fans in an announced crowd of 58,545 that looked considerably smaller booed after Panthers linebacker Luke Kuechly intercepted Winston in the fourth quarter. Koetter shrugged off questions about whether Winston suffered a setback with his injury the previous week during a 30-27 loss at Buffalo. The quarterback threw for 384 yards, three TDs and one interception against the Bills, also took a hard hit on a sack/fumble. Julius Peppers had one of Carolina’s three sacks, forcing a second quarter fumble. ”They have a great defense, but you turn the ball over three times, you’re not going to win. You score three points, you’re not going to win,” Winston said. Koetter said he told the team after the game he felt their effort was good. ”I thought it was good enough to not point fingers, and if they need to point fingers, point them at me,” Koetter said, adding he’s ”disappointed” but not necessarily ”stunned” to be off to such a slow start. Right tackle Demar Dotson said there’s time to save the season, but only if the Bucs begin now.